Singapore clinched foreign direct investments (FDI) worth $48.23b (US$35b) in H1 2018, pushing Southeast Asia’s FDI inflows by 18% to $100.59b (US$73b), the Investment Trends Monitor published by the United Nations Conference on Trade and Development (UNCTAD) revealed. More new flats were sold and more existing flats underwent upgrading, contributing partly to a 44.4 per cent spike in the Housing Board’s (HDB) net deficit in the last financial year. Shares rose in Taiwan, Singapore, Indonesia and the Philippines. A recent report on the wealth gap in various countries has led to renewed debater in Singapore, where a government famous for minimal welfare spending has sought to address what has long been a sensitive issue. Amid an ongoing furore over charges imposed at social enterprise hawker centres, Senior Minister of State for the Environment and Water Resources Amy Khor has tasked the National Environment Agency (NEA) to conduct a stock-take of the social enterprise model. SINGAPORE (Reuters) – Oil prices rose on Monday as markets were expected to tighten once US sanctions against Iran’s crude exports are implemented next month. Several Singaporeans are highlighting that Central Provident Fund (CPF) Board’s chief executive, Ng Chee Peng, is ruling party politician Ng Chee Meng’s younger brother, on social media today. Uber Technologies Inc has decided to appeal a decision by the Singapore competition regulator that its merger with regional rival Grab violated the city-state’s competition laws, the firm said on Monday. For a one-bedroom unit worth $838,000, buyers will get to have an integrated sink and dishwasher that could help slash washing time by 50%, amongst its many smart home features. The Car-Free Sunday event will stretch over three days this month to allow more to experience parts of the city centre unclogged by traffic, with Singapore’s first Car-Free Weekend event. Successful or wealthy Singaporeans “owe respect and gratitude” to their fellow citizens, and they have a “responsibility to contribute back something” to the society and the system which enabled them to do well, said Prime Minister Lee Hsien Loong as he noted the importance of social attitudes in addressing inequality. Singapore has a meritocratic system, but it has to ensure a level playing field and help everyone get to a good starting point so that they can succeed regardless of family background, said Prime Minister Lee Hsien Loong. From Tuesday (Oct 23), consumers in certain districts will be able to deliver parcels and items using GrabExpress, as the ride-hailing firm goes for a stake in the last-mile logistics segment in Singapore. The 380 participating investors who enrolled for the Singapore FinTech Festival’s deal-making platform, MATCH, are planning to invest US$6.2 billion ($8.5 billion) in Asean enterprises next year, and an additional US$6 billion over the subsequent two years, announced the Monetary Authority of Singapore (MAS). A syndicate involved in almost $20 million worth of Internet love scams has been crippled in a joint international operation involving officers from Singapore, Malaysia and Hong Kong. Singapore-headquartered ride-hailing firm Grab may be synonymous with transport services, but the five-year-old business is steering its way towards bigger things, starting with food. Users can now log in using their fingerprint, facial recognition or a six digit passcode. Local and overseas SingPass users can now download a new mobile app which will let them access and perform government transactions on the go, an announcement revealed. SINGAPORE (Oct 22): United Overseas Bank (UOB) has launched an innovation and internationalisation programme to provide financial support and cross-border opportunities to small- and medium-sized enterprises (SMEs). More women here are opting to deliver their baby via a caesarean section rather than the natural way, in line with a rising trend globally. BUSINESS professionals in developing countries are surprisingly more optimistic about the global trade outlook than those in the developed world, a Bloomberg survey found. Creators of the coin-sorting wallet received more than S$250,000 from the crowdfunding platform Kickstarter, but have struggled to deliver customers’ orders. A 14-member committee has been set up to oversee and guide Singapore’s effort to nominate its hawker culture for Unesco’s list of intangible cultural heritage. (Oct 22): Singapore plans to spur investment in much-needed infrastructure in Southeast Asia by helping to structure projects to make them more “bankable,” a senior official said. GRAB will launch in Singapore on Tuesday a beta trial of GrabExpress, its on-demand door-to-door delivery and courier service, to serve the growing demand for instant delivery of parcels. Eight ships kicked off the first Asean-China Maritime Field Training Exercise in Zhanjiang in China’s southern Guangdong province yesterday. SINGAPORE (Oct 22): United Overseas Bank (UOB) has successfully digitised application processes for all its consumer banking product offerings. Apps firm Grab has decided not to appeal against an anti-competitive penalty, and will pay the $6.42 million fine imposed by the Competition and Consumer Commission of Singapore (CCCS) last month. Deliveroo rolled out an online portal which will provide data and insights on how restaurants’ delivery services perform, an announcement revealed. SGX’s 1Q19 earnings of $91 million was up 1% y-o-y, representing 24% of FY19F which RHB Research deems as coming in line with expectations. SINGAPORE – A long e-scooter seen on the road over the weekend has been impounded by the Land Transport Authority (LTA). SINGAPORE (Oct 22): Uber Technologies Inc has decided to appeal a decision by the Singapore competition regulator that its merger with regional rival Grab violated the city-state’s competition laws, the firm said on Monday. Singapore continues to lead Asia’s pension schemes for the tenth consecutive year, according to the Global Pension Index by Melbourne Mercer. It sealed continuous improvement in its index score of 70.4 from 69.4 in 2017 due to improvements in the sustainability sub-index. While trade tensions between the US and China are raising concerns about the implications for the global economy, business professionals around the world are optimistic about global trade, according to a survey published on Monday (Oct 22). UOB revealed that it will digitalise all application processes for its consumer banking products, in what it claims is the first such move in Singapore. These will include deposit accounts, credit and debit cards, personal loans, and secured loans such as car and home loans. 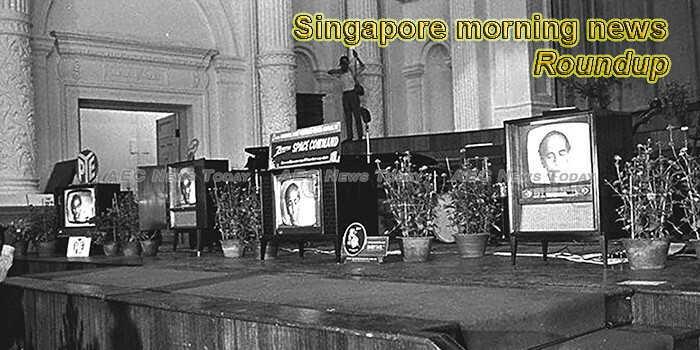 This week’s Singapore morning news feature photo acknowledges World Day for Audiovisual Heritage, October 27.